Since food is expensive and mushrooms are highly nutritious, I think it’s worth looking at some edible mushrooms even a beginner (like me) can pluck, identify and safely consume without worrying. NOTE: I shouldn’t have to say this, but I will, just in case a bureaucrat is reading: don’t go eating any mushrooms you’re not completely sure are safe. And don’t sue us if you get a stomachache. Do your own research on mushrooms. We’re just providing a few ideas to get you started. At the end of summer, the rain and cooler weather did its work and a wide variety of beautiful mushrooms appeared across my food forest. I counted over 30 species in one week… and had a realization: I knew almost nothing about identifying mushrooms. Sure, I probably knew more than the average Joe. I knew that some fungi worked in harmony with trees to provide them with nutrients… I knew that many fungi were the primary decomposers of wood… I knew that mushrooms were just the fruiting body of a much larger, ofter perennial organism living beneath the soil. But naming the mushrooms popping up around my yard? Impossible. This hit me as rather pathetic. I know the names of many animals and insect and I’m an encyclopedia when it somes to plants – but mushrooms? I think I could name 10, though I wouldn’t even be able to identify most of them by sight. 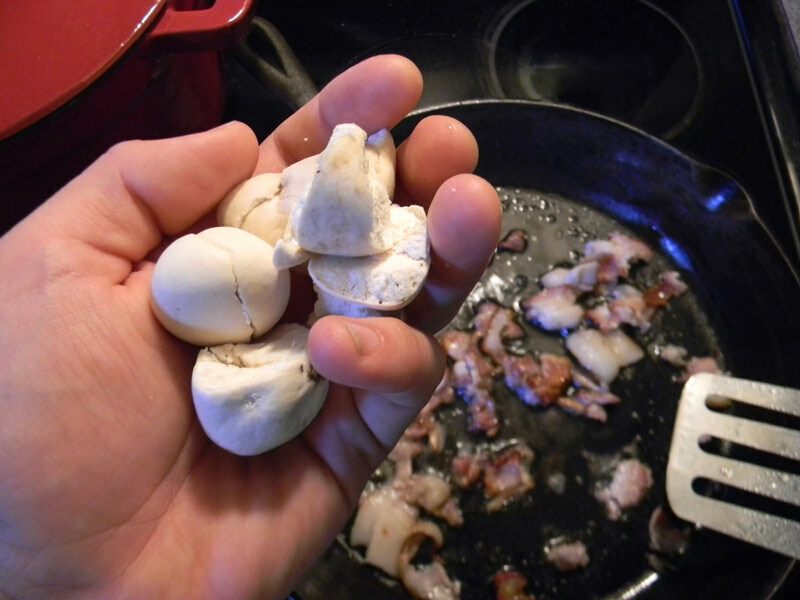 Back when I lived in Tennessee, I did eat puffball mushrooms, once I learned how to safely identify ones that were okay for the table. Pretty sad for a prepper/wild forager/garden expert. Seeing the many species erupt in my food forest gave me a new passion: to learn about fungi and to learn which ones I could safely eat. After a few weeks of research, I’ve foraged around for some of the super-easy mushrooms for beginners and prepared them for my table. I’m still here. Not poisoned a bit. And I haven’t eaten this good in a long time! Boletes are easy to spot and stand out from other mushrooms because they lack gills. 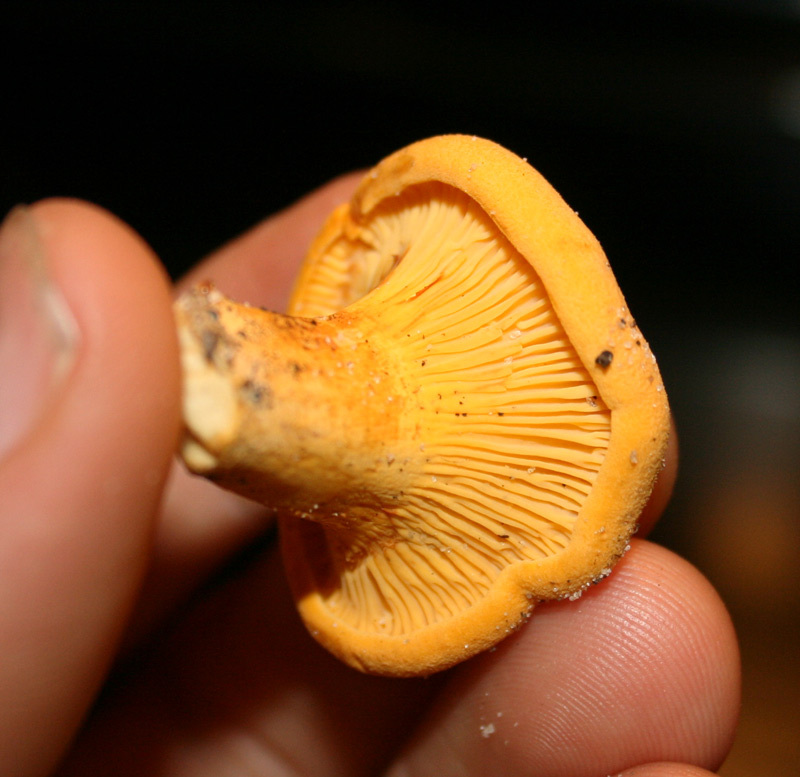 If you’re a beginning forager, the rule of thumb is AVOID mushrooms with gills. Some non-gilled mushrooms can make you sick, yet none of them are likely to kill you. You might wish you were dead, but you wouldn’t be meeting St. Peter a few days after ingestion like you would if you accidentally ate some Destroying Angels. Boletes almost always grow beneath trees. In my neighborhood they love oaks. As a dried mushrooms they’re very hard to beat. How do you know if you have an edible bolete? Here’s the way to stay (generally) safe from stomach upset: avoid boletes that stain blue when cut or bruised. 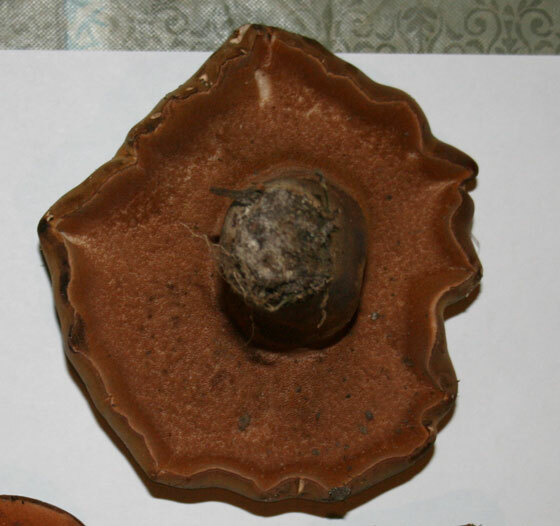 Also avoid boletes that have red or yellow pores. I’ve followed this advice and have eaten three or four different species without any trouble. Some of them were really delicious and far surpassed the flavor of store mushrooms. 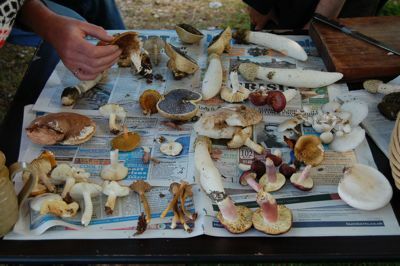 The best way to ensure complete bolete safety is to get a hold of a few mushroom guides and double-check what you find. If you’re really lucky you’ll discover some huge King boletes you can brag about. Unlike the meaty heftiness of boletes, chanterelles are delicate mushrooms with a marvelous fruity flavor that’s hard to pin down. When you feel the ridges on a chanterelle they don’t crumble, unlike typical mushroom gills. 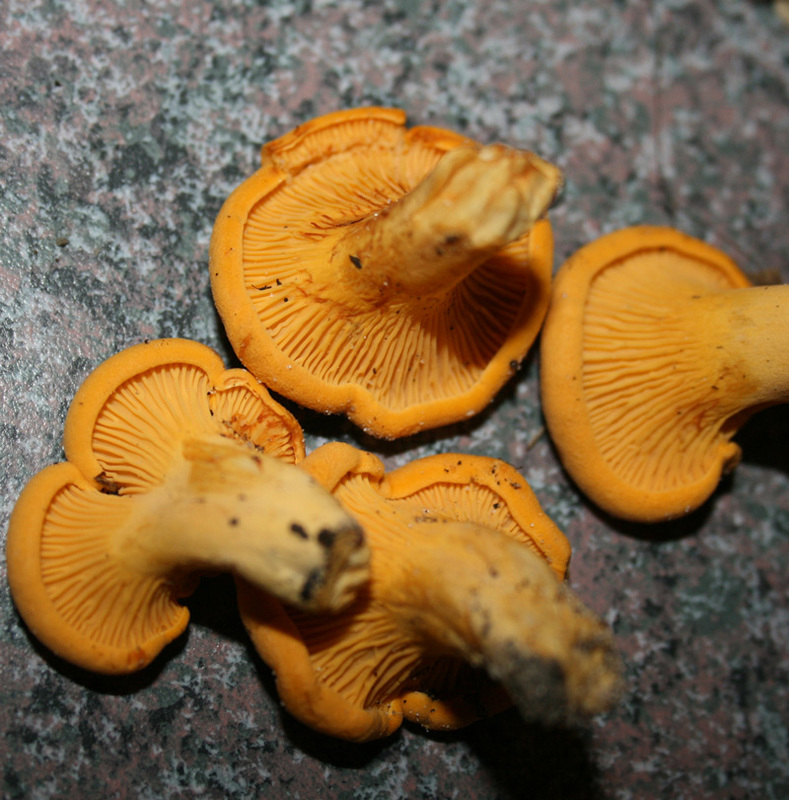 Again – make sure you have chanterelles. Some folks have gotten them mixed up withJack-o-Lantern mushrooms and given themselves some horrid upset stomachs. Get to know what both look like. Once you find chanterelles – a really easy-to-identify edible mushroom – you’ll keep finding them easily. Once you eat them, you’ll also want more. I’m going looking again this afternoon. Puffballs are easy to identify as puffballs; it’s just hard to tell which species you have. That’s okay since most puffballs are edible. 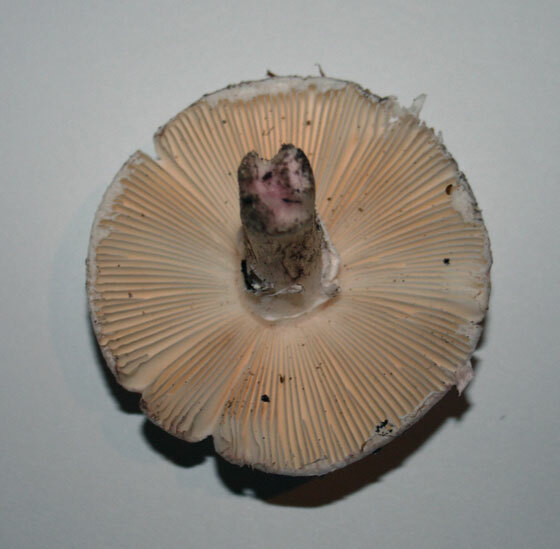 If you find one, cut it in half to make sure you didn’t pick the “button” stage of a gilled mushroom on accident. If it’s clear, white flesh all the way through, with no hint of gills or other structures, you’re good to go. Puffballs have a mild flavor and are good with bacon. Everything’s good with bacon. NOTE: if your puffball isn’t white inside, avoid it. It’s either past its prime or it could be a toxic relative. You want it nice and white all the way through. Morels are a mushroom I can only dream about finding. 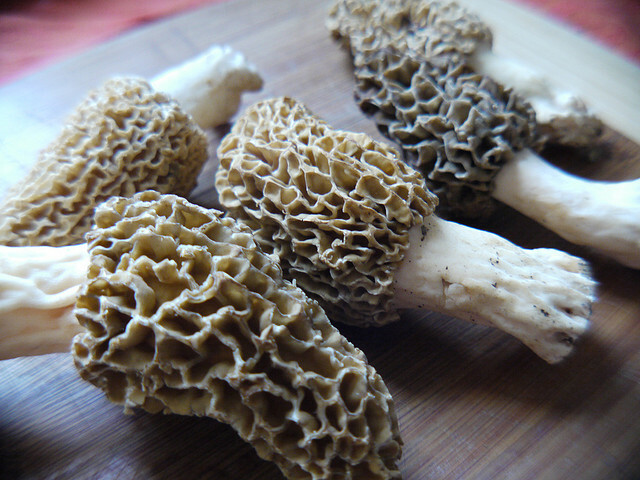 Finding morels in Florida is like finding honesty in D.C. – it’s so uncommon as to be not worth the hunt. Since I haven’t actively hunted for these guys, I can’t tell you much about them; however, I did find a great article from Field and Stream that will get you started. There’s food everywhere, folks – including lots of edible mushrooms. Learn what you can eat now and you’ll be feasting when others are living on spam and rice.